With a low risk area defined in north central OK, the marginal setup was just close enough to entice me (Jason) to head out from my home in Edmond to see what might pop up along the incoming front. I drove to Tonkawa, OK and waited for cells to fire. A small cluster of storms began to build and then fail just west of Enid when one decided to root itself and build into a small LP supercell. 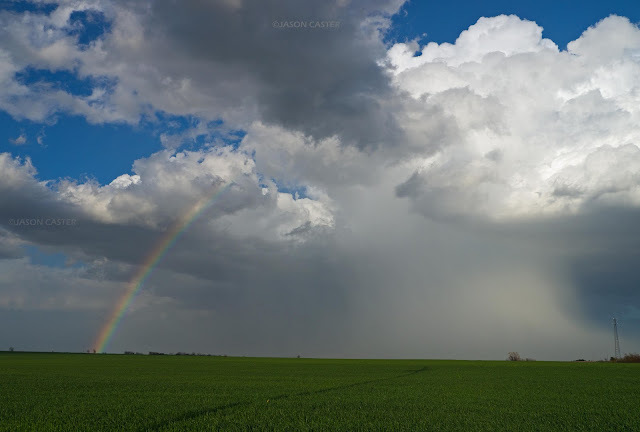 It never built quite enough strength to become severe, but as I let it pass to see if the storm was photogenic in sunlight, I was treated to a brilliant rainbow alongside the hail shaft.